Drafting and Negotiating the Pro-Landlord Office Building Parking Clause, Sixty Questions the Major Suburban Office Tenant Should Ask About Parking Rights, Lease Clause Critique: The Aggressively Pro-Tenant Office Parking Clause, Making a Deal with a Parking Garage Operator After Lease Up, The Ins and Outs of Parking Lot Leases, and The Pro-Tenant Governmental Actions Clause for Parking Lot Leases. When a major tenant agrees to take a large chunk of space in an office complex, it has the opportunity to gobble up more than its fair share of the parking earmarked for the project. As far as the landlord is concerned, that "fair share" is the number of parking spaces proportional to the percentage of the project leased by the tenant. According to the landlord, if a strong tenant proposes to lease a third of the project, the tenant should get a third of the parking spaces, absent special factors affecting the complex. However, office tenants tend to count up how many parking spaces they need based upon their personnel, including projected new hires over the term of the lease, and announce the total at the bargaining table as the number of spaces required to make the deal. Forget proportionality, says the tenant—that is something for the landlord to worry about. From the landlord's perspective, if the major tenant takes a disproportionate share of parking for the complex, it will produce grief for the landlord down the road. The landlord won't have enough parking to mete out to the balance of the tenants in the project. The problem is particularly severe for suburban office projects because they typically lack good public transportation that can reduce the reliance of their commuter tenants upon personal automobile transportation. These factors make it incumbent upon the parties to the major office deal to negotiate and draft parking provisions with extreme care. As far as the tenant is concerned, it will normally be forced to respond to pro-landlord parking clauses already contained in the landlord's form lease. If the tenant fails to negotiate proper parking protections, it may finds that it has inadequate parking during the term, which will be a major headache for its officers, employees, and visitors. What's more, after the lease is signed, it may be difficult to get more parking, especially if parking is in short supply in the garage serving the building. THE FOLLOWING TEXT IS AN EXCERPT FROM THE SIXTY QUESTIONS. 1. 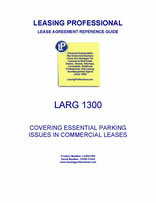 If building parking provisions are contained in an agreement separate from the lease, does the lease contain cross default provisions making a default under the parking agreement a default under the lease? 2. If the tenant's parking rights are contained in a parking agreement separate from the office lease, can the tenant assign or sublease its parking spaces to a third party without the landlord's consent? 3. If the tenant's parking rights are contained in a separate parking agreement, can the tenant assign or sublease its parking spaces to a third party separately without assigning the lease itself? 4. How many parking spaces are assigned to the tenant? 5. Is the total number of spaces provided by the landlord for the complex, whether in parking structures or as surface parking, specified in the lease? 6. Does the lease prohibit the landlord from reducing the number of spaces for the complex during the term of the tenant's lease? 7. Does the language of the lease prevent the landlord from converting unreserved non-exclusive spaces to reserved spaces for the benefit of one tenant during the term of the tenant's lease? 8. Are the tenant's spaces subject to relocation by the landlord during the term of the lease? 9. Is the landlord providing card keys for access to parking structures containing unreserved spaces? 10. If so, are there limitations upon the number of card keys that the landlord may distribute?